I am so bad with time and I can not believe that we are almost half way through June. Why is it that the older we get the faster time goes? The whole concept scares me but it is part of life and I need to embrace it. So before June is over I wanted to share some of my affordable closet staples that I always keep in my rotation. Stay tuned for the next 3 posts to see some great steals. 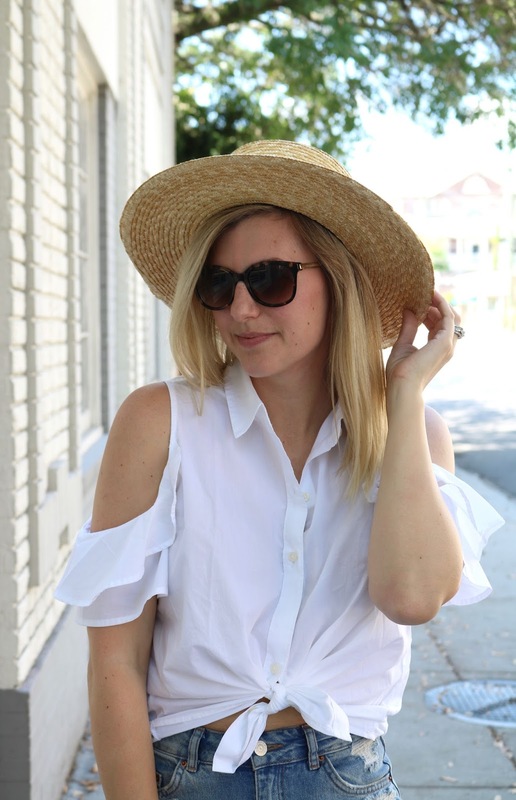 This top is so comfy and a perfect staple to throw on for dressy or casual occasions. I have now worn this top with overalls, linen pants, a dressy skirt and also denim shorts (above). Speaking of denim shorts, is anyone else really obsessed with the distressed denim trend, like me? I seem to not be able to get enough holes in all my pants (silly right?). My sister in Law now has me experimenting with DIYing my own distressed pants, ahh. I will keep you posted on how they turn out. Thanks for stopping by and I hope everyone had a great weekend!!! Time flying by scares me too, but I am learning to live in the moment and embrace it all! Love this look 🙂 Great post! Distressed denim really never goes out of style and you are rocking it here!! Time flies so fast!! I love this top on you! Amazing look dear – love this blouse! The perfect summer look, love it! !